1. Choose a fresh rich soil. It’s always required a healthy soil for a better yield of vegetables. Due to routine usage of soil, it may turn into dull or insipid. Hence periodic replacement of soil is necessary. 2. Select your own vegetables list for your garden. Make your own list of variety of vegetables and look that it’s not restricted to tomatoes and lettuce. Usually, a vegetable garden may have three to five varieties of salad greens, lettuce and don’t forget to have iceberg lettuce in your garden which is highly familiar and liked by all. Lettuce varieties like purple, red, curly-leafed and romaine are not only attractive and add beauty to your garden but they are also edible. In case of restricted place for gardening, greens and lettuce can be planted in a petty jar which can be either hanged in windows of kitchen or outside of your patio. If there is a wide space for gardening, it can be planted there. Spinach, carrots, radishes, garlic chives, tomatoes, onions and cabbage are other plants which can be planted in your garden. 3. Always choose a place with sunny spot and near water source. For your plants to grow healthier both of these are required. 4. Sketch a plan for your garden. It gives an idea for how the garden should look. Planting a tepee trellis or obelisk at the middle of the garden provides an anchor for the beds. The plan should also denote the position of the tallest plants as the wrong positioning may block the sunlight for the plants underneath. Hence it’s best to have them at east side. 5. Work for good looking garden. Edible flowers like dianthus and nasturtium can be planted at the corners of greens which add more attraction to your garden. In order to complete the fencing, the trailing herbs can be used. Make your garden sustainable for many years with an aim for successive quick harvest. Also plant the greens tightly. For bush cucumbers include early Bibb lettuce. Replace the tomatoes at season ends with the best alternatives like fall collards and garlic. For increasing the small spaces you can incorporate bush variants or dwarf. 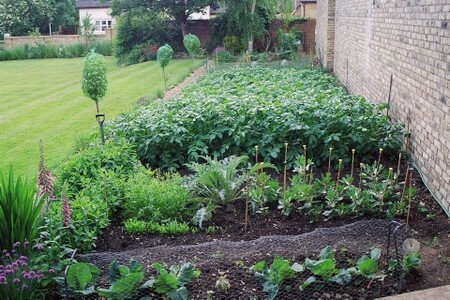 Main purpose of vegetable garden is it should provide best yield for all seasons.